You do not have to spend a huge amount of money on expensive, top brand shoes to fit over plastic molded AFO’s and KAFO's. We recommend a wide width shoe from Payless or Wal-Mart classified as a 'Skate Shoe'. There are numerous manufacturers that offer this style of shoes. 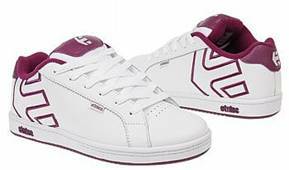 Below is a picture of a typical 'Skate Shoe'. Shoes that fit over AFOs and KAFOs serve two general purposes: provide protection from the elements and prevent slippage when the child ambulates. A child should never walk on their plastic orthosis without shoes as the bottom of the brace is very slippery.